Choosing a stroller requires careful thought and consideration. After all, you trust it with your baby’s safety. To make your decision less overwhelming, we’ve researched some of the most popular models on the market. If you’re looking for a versatile option that’s easy to maneuver, a Britax stroller might be the answer. Most Britax models — including the B-Ready stroller and the B-Agile and B-Safe travel system — can accommodate babies through toddlerhood. When your child is an infant, you can latch his or her Britax car seat into any Britax stroller using the Click-and-Go connector system. And when your child is big enough, you can use the stroller without the car seat for a roomier ride. If you need your stroller to perform double duty, the B-Agile Double can cart around two kids, even if they’re different ages. Additionally, Britax models are designed to be strong on safety, but most are also easy for parents to carry and maneuver. NerdWallet Shopping’s scoring of the best Britax strollers is based on our analysis of the opinions of experts and shoppers like you. To narrow down the field, we looked at expert opinions from review sites such as The Sweethome, CNET and Good Housekeeping. After that, we analyzed user reviews to see what shoppers were saying about each stroller’s best —and worst — attributes. We recognize that consumers look for different qualities in strollers, so we scored these user observations based on a handful of different features, including ease of use, weight, safety, accessories and more. Overall score: This score is indicative of reviewers’ overall satisfaction level with the stroller across 13 criteria, including ease of use, maneuverability, accessories and durability. Functionality: This score reflects reviewers’ satisfaction with the stroller’s level of functionality, in particular how it relates to the baby. Categories that factor into this score include comfort, safety features and noise level. 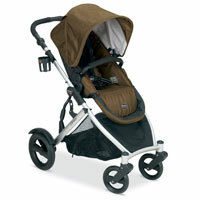 Ease of use: This score indicates reviewers’ satisfaction with how easy it is to use the stroller. Categories that factor into this score include ability to fold the stroller, the stroller’s weight and its maneuverability. These strollers are our top picks, ranked in order of overall score. 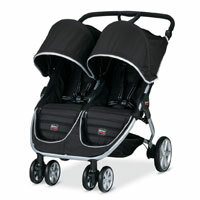 Britax’s side-by-side stroller can handle two little ones without sacrificing maneuverability. Parents love its reclining seats, which let them securely cart around children of different ages. Attachments and accessories, such as cup holders and trays, must be purchased separately. Stroller seat belt can be difficult to latch. Attachments and accessories sold separately. As the name implies, the B-Ready stroller keeps you mobile. 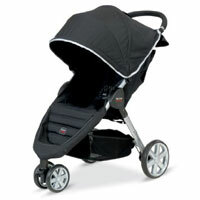 It can support Britax car seats and bassinets, and it can adjust to let your child sit upright. If your family grows, you can convert it into a double stroller by attaching a second seat behind the storage basket. The B-Agile and B-Safe travel system is another product designed to grow with your child. The infant car seat easily snaps into the stroller base, and when your child gets older, you can remove the attachment so he or she can sit in the padded seat. Parents also like the large canopy that protects their babies from the elements. Provides a comfortable, safe ride for baby. Offers easy click connections between the car seat and base. Heavy car seat padding, which can be too warm. No stroller foot rest for child. 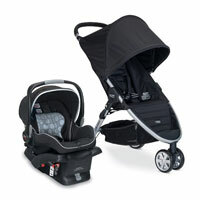 Its lightweight aluminum frame and one-hand fold design make the single version of the B-Agile Double a parent favorite. Users love the B-Agile’s large storage basket, with zippered pockets for hiding important items, such as cell phones, wallets and keys. But they weren’t fans of the stroller’s hard foam wheels. They felt rubber tires would have given the stroller better suspension. Nina Tabios is a staff writer at NerdWallet, a personal finance website. Email: ntabios@nerdwallet.com.